One term often referred to by investors and lenders is working capital. The financial projections template cash flow statement refers to changes in working capital as part of the cash flow from operating activities, but what is working capital, what does it mean, and how does it affect cash flow? In a normal business, costs are incurred on purchases of inventory, wages, and other operating expenses in order to eventually create sales for the business. The money generated by the sales is then reinvested in the business to purchase more inventory, and incur more wages, and operating expenses, and the cycle repeats itself. Hopefully if we have done our sums correctly, the revenue exceeds the expenses and a profit is generated. In an entirely cash based business, the cycle is one of cash flowing around the business without interruption. For example, suppose a business purchases a product costing 50, and immediately sells it for 120, making a profit of 70. The 50 flows out of the bank account to pay for the product, and 120 is immediately received from the sale. This is summarized in the diagram below. Expenses are also shown on the diagram but for simplicity are assumed to be nil in this example. The cash flow from operating actives section of the cash flow statement would look like this. 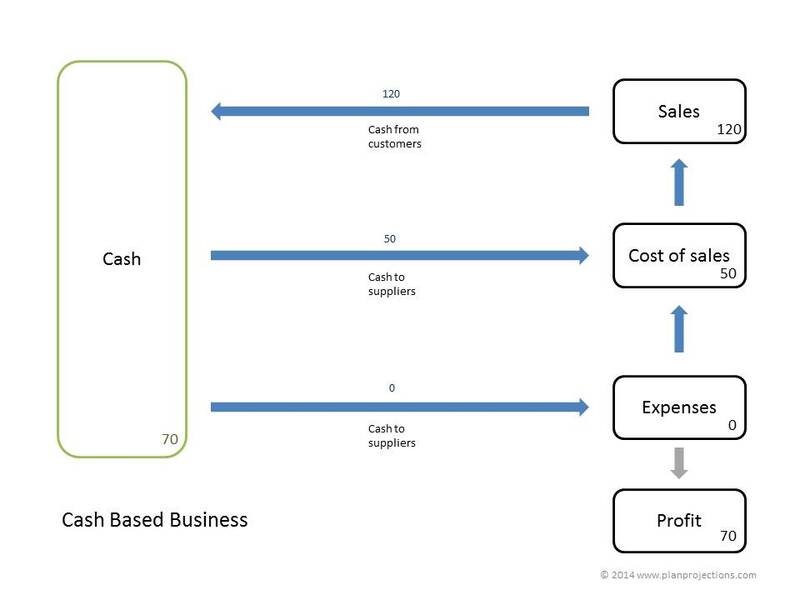 In this simplified cash based business the cash and the profit are the same. The cash in the bank account is now 70 being the 120 received from the sale less the 50 paid for the product. The profit is also 70 resulting from the sales of 120 less the costs of 50. However, very few businesses operate in this manner, in most businesses purchases of goods are made and expenses are incurred on credit and a balance of monies due to suppliers is built up, additional purchases are made resulting in an inventory of goods held in the warehouse, and finally, when a sale is made, goods are dispatched to the customer on credit resulting in a balance of monies owed by the customer. In accounting terms the credit built up with suppliers is referred to as accounts payable, the goods held in the warehouse are referred to as inventory, and the monies owed by customers are called accounts receivable. As an example, suppose in our credit based business we purchase goods on credit costing 80, hold 30 as inventory, and sell the balance (50) on credit for 120, as shown in the diagram below. Again our profit is 70 which is the difference between the sales value (120) and the cost of the product sold (50), but what has happened to the cash? No cash has flowed in or out of the business. We have purchased goods of 80 on credit and we now owe the supplier 80 (accounts payable). We have made a sale on credit of 120 and our customers now owe us 120 (accounts receivable). And finally, since we only sold goods worth 50, the remaining product of 30 is sitting in our warehouse as inventory. The net cash flow into the business from operating activities is nil. In our simplified business, we assumed that the opening balances for accounts receivable, inventory, and accounts payable were zero. What affected the cash flow from one period to the next was the change in the working capital during the accounting period, summarized by the table below. This can be summarized in the change in working capital formula below. The minus sign is important as the effect on the cash flow is the exact opposite of the change in working capital. For example, if at the start of an accounting period, the balance sheet shows accounts receivable of 70,000, inventory of 40,000 and accounts payable of 30,000, then the working capital is. Suppose the balance sheet at the end of the accounting period shows accounts receivable of 90,000, inventory of 55,000 and accounts payable of 35,000, then the working capital is. The working capital has increased over the accounting period by 30,000 as summarized in the table below. The business has net income of 70,000, but the net increase in working capital of 30,000 reduces the operating cash flow to 40,000. Notice that the effect on the cash flow shown in the cash flow statement (-30,000) is the opposite of the change in working capital (+30,000). To summarize, the operating cash flow of a business is affected by the changes in working capital during the period. If the working capital increases then the cash flow decreases, likewise if it decreases, then the cash flow increases. Overtrading occurs when a business does not have sufficient finance for the level of working capital needed to support its level of trading. Overtrading often occurs with start up businesses as they have do not have the financial resources and access to capital that more established businesses have. Typically, a startup business will seek to expand rapidly and in doing so will create the need for additional working capital. The faster the business grows the more working capital and therefore the more cash it needs. The additional working capital requirement comes from two main sources. Inventory will need to increase to satisfy customer demand as the business grows. Amounts outstanding from customers (accounts receivable) will increase as sales increase. Of course this increase will be offset by an increase in amounts due to suppliers (accounts payable), but unfortunately for a new business, credit offered by suppliers does not normally increase as rapidly as the requirement to give credit to customers. This increase in working capital needs to be financed. Without additional funding to match the growth in the business, the cash balance will start to fall until the business cannot pay its suppliers. At this point the business will not be able to get the supplies of inventory necessary to satisfy customer demand, and the business will start to fail. Reduce the amount of credit given to customers and speed up collections by cash settlement discounts in order to reduce accounts receivable. Obtain additional credit from suppliers in order to increase accounts payable. All businesses need working capital, however, the level of working capital, and the changes in working capital during an accounting period directly impact the cash flowing in or out of the business and the amount of funding required from investors and lenders. When producing a financial projection for a business plan, it is important to calculate working capital levels correctly. In the financial projections template this is achieved by changing the following three parameters. 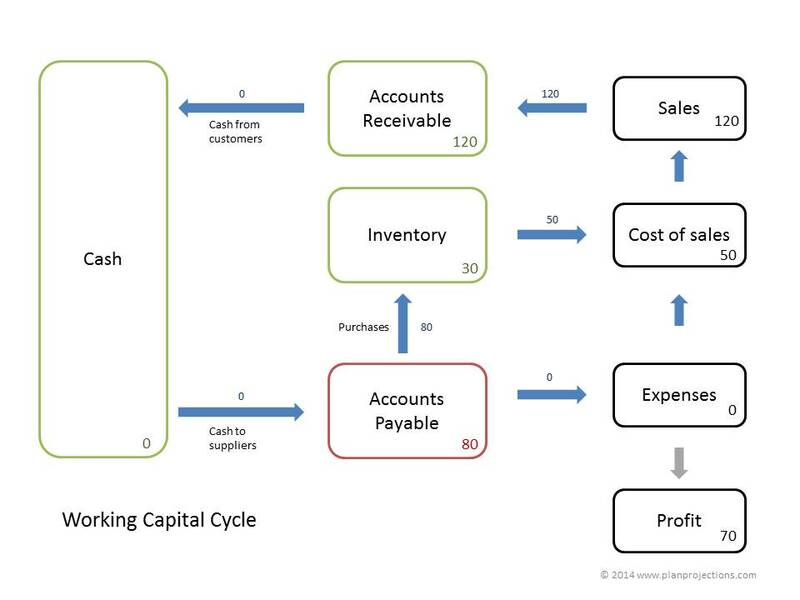 The working capital diagrams used in this tutorial are available for download in PDF format by following the link below.